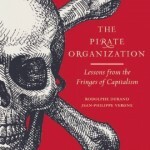 The Pirate Organization: Lessons from the Fringes of Capitalism is out from Harvard Business Review Press! When capitalism spread along the trade routes toward the Indies…when radio opened an era of mass communication…when the Internet became part of the global economy…pirates were there. And although most people see pirates as solitary anarchists out to destroy capitalism, it turns out the opposite is true. They are the ones who forge the path. In “The Pirate Organization,” Rodolphe Durand and Jean-Philippe Vergne argue that piracy drives capitalism’s evolution and foreshadows the direction of the economy. First published in French to great critical acclaim and commercial success as “L’Organisation Pirate: Essai sur l’évolution du capitalisme,” this book shows that piracy is not random. It’s predictable, it cannot be separated from capitalism, and it likely will be the source of capitalism’s continuing evolution.